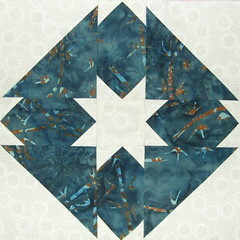 This month’s lotto block is Goshen Star. We’re making the blocks in batiks on cream/tan tone-on-tone backgrounds. Because I am not a precise sewer, I found it useful to measure and square up both the HSTs and the rectangular units before assembling the block. Kate also suggests that when constructing the rectangle units that instead of sewing ON the diagonal for the little background squares, sew just to the outside of the diagonal – to give yourself that much more space to turn and press the corner squares. 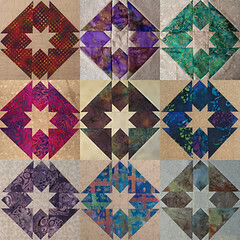 Janet Wickell recently blogged an article for the about.com Quilting site which has great information about pressing blocks and links to other tips for building better blocks … for the lotto, for swaps and for yourself. This is a composite of block photos sent to me by Kate, Lee Ann and Michelle. I think this is going to be a great month for the Beginner Block Lotto.